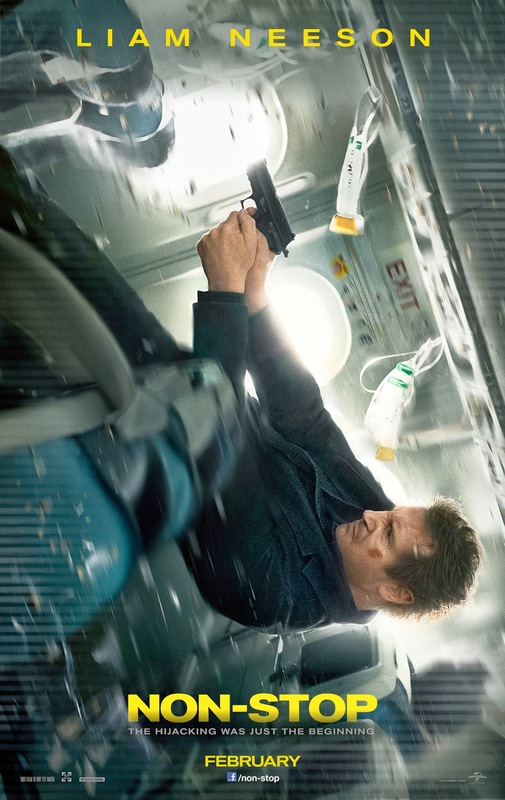 Non-Stop is the latest stop in Liam Neeson's surprising second career as an action star. Reteaming with the director of his pretty awful earlier action vehicle Unknown, Neeson plays Bill Marks; an air marshal who we first see putting vodka in his drink, demonstrating early on that Non-Stop is going to attempt a downbeat, serious, tone. Soon after his flight takes off Marks receives a text message from someone on the plane saying that unless they are paid $150 million within the next 20 minutes someone on board will be killed. As the flight wears on and things become more serious it is clear that whoever Marks is communicating with is trying to frame him for this hijacking.. or are they? Non-Stop is absolutely ludicrous. The plot twists and turns, the ability of the mystery texter (and thanks, 21st century, for that phrase) to predict what Marks and other people on the plane will do doesn't so much strain credulity as rip it into little pieces before dancing around the cabin, throwing it in the air like confetti. This isn't a problem in action cinema, these movies are allowed to be completely insane, but the best of them – Con Air, for instance – have a sense of their own ridiculousness and even if they don't wink at the audience they embrace that sense of abandon and enjoy their own madness. This is where Non-Stop's tonal issues raise their ugly head. The film is bonkers enough that it could have fun with itself, but it absolutely refuses. Neeson makes for a relentlessly dour hero; he has no one liners. This, again, needn't be an issue. The John McClane of the first three Die Hard films was an alcoholic burnout barely holding himself or his family together, but the film spent serious time on developing him and his relationship with Holly. If Non-Stop wants, as it seems to, us to identify with Marks as a serious character it would help to give him a character before a rushed and treacly third act infodump. The other lesson of Die Hard that is forgotten by this film is that serious and fun don't have to be mutually exclusive. One of the main reasons that McClane came off as a real and a likeable guy was that he had wit as well as guts, and, crucially, acknowledged the absurdity of his situation (“Come out to the coast, we'll get together, have a few laughs”). There is much waiting around before any action really kicks in here, so the film must try to work as a thriller (in that Marks himself becomes a suspect Non-Stop's closest cousin is perhaps Flightplan, and just take a second to think about how sad a statement that is). This is completely undermined by the fact that its main device for suspense is a series of text messages that pop up on Marks' phone. In a way I'm glad that Jaume Collet-Serra elected not to cut to Marks' phone for each and every message, but the device of having them flash up on screen does have the major downside of making the film itself feel as though, not unlike the person next to you in the cinema, it is constantly checking its phone. As a device, it aspires to be scary through its mystery, but instead it robs the film of tension. There's no menace in a string of text messages because there is no sense of the person sending them. If Marks were talking, rather than texting, with his tormentor, we could get some sense of that person, we could guess at their motives and things would feel more personal. As it is there is little sense of threat. Being a relatively expensive looking film, Non-Stop can afford a cast more talented than its screenplay warrants. Neeson and co-star Julianne Moore are both legitimately fine actors and both are utterly wasted on this pathetically thin material. Moore, if such a thing is possible, has even less of a character to work with than Neeson. She plays... a woman who likes the window seat. Really, until her own mawkish third act infodump that is the extent, the be all and end all, of her character: she likes the window seat. Well, I'm glad she's our second lead, she's FASCINATING. Neeson is also dreadful. Though he's given little to play, an actor of his talent and charisma should be able to make a decent fist of a role this basic. Instead, Neeson seems to hit autopilot in the very first scene and never engage manual thereafter. He looks and sounds bored and that feeling translates to the audience. The supporting cast is also reasonably talented, but also totally wasted. The presence of Lupita Nyong'O is notable only in the context of her recent Oscar win. She has less than nothing to play here and says perhaps four lines in the whole film. More notable in terms of the story are Corey Stoll; a solid character actor in House of Cards but just another anonymous filler part here and Downton Abbey's Michelle Dockery. Dockery isn't called upon to be much more than a pretty face, but she's more than qualified in that respect and is the only member of the supporting cast who demonstrates any real presence. In the typical way of mainstream action films in recent years, Non-Stop looks absolutely terrible. Trust me, I'm as bored of writing about this as you are of reading about it but here, AGAIN, is a mainstream movie that is almost completely composed of a single colour: steel blue. The lighting is blue, the interior of the plane is blue, many of the characters are wearing blue. Michael Mann has the excuse of this being his career long visual style, but why must every film look like this now? And why must every shot of Non-Stop look like this? The problem isn't just that it's boring (though it is) but that it masks any sense of directorial identity when everything looks the same. To offer Jaume Collet-Serra a modicum of credit he doesn't indulge too heavily in the twin diseases of recent mainstream action cinema; shakycam isn't too prevalent and lens flare all but absent. This, however, is not to say that Non-Stop is well or excitingly directed. The action is thin on the ground and when it does come it feels anticlimactic. An early fight feels compromised by the 12A rating, but it's by far the film's best action beat. By contrast, the eventual conflict with the main bad guy is terrible and entirely anti-climactic. It is also unhelpful that, late in the day, the film introduces a clanging and laughably unearned political context, in which it essentially bellows what tiny smattering of subtext it has. Non-Stop is pretty damn awful all round. It is my belief that mainstream action cinema is, to a very large degree, broken. If you want to fix it you could do worse than use this film as an exemplar text in what not to do. Please, please, make them stop.